Sinkhole swallows homes, 3 people and a truck. I recall something like this happened in Seattle many years ago because previously there was a big fire and then streets were filled with much material that is not acceptable fill… like upside down canoes and couches that left pockets of air under the road. Seattle actually has quite the history of having sinkholes due to many different reasons. Some due to ruptured sewer or water main lines like below. Guatemala City has great need for better storm water drainage systems. There are entire neighborhoods that regularly get flooded too often that could be avoided with proper drainage. At FVH we wrestle with erosion along roads as everything is so steep that to creat a road means digging into the mountain and leaving a wall on one side and cliff on the other. So we regularly have landslides during rainy season, which is just around the corner. Next Friday the 23 we have a group coming down to help rebuild one out of 5 homes in our community that was lost or is on the brink of getting washed out because of Hurricane Stan compiled with regular rain of rainy season. 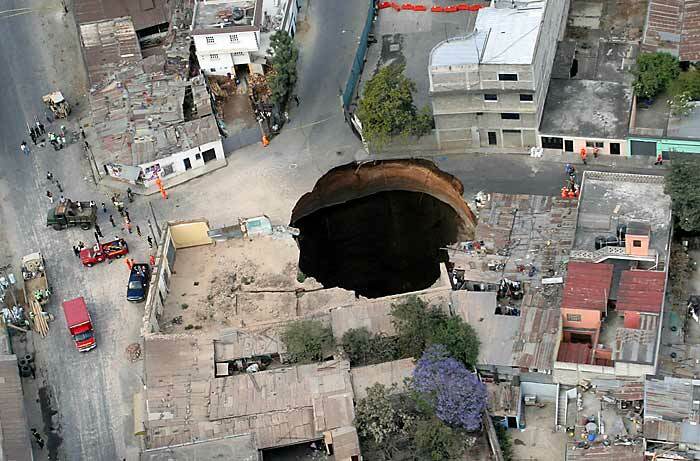 Here are a few more pics and the story of the sink hole in Guatemala City. subscribing in your augment or even I fulfillment you access persistently fast. 3 people and a truck. | FincaVistaHermosa. by brain dead visitors? 😛 And, if you are writing on other online sites, I would like to keep up with you. Would you post a list of the complete urls of your shared pages like your Facebook page, twitter feed, or linkedin profile?